The incredible thing about England is that around every corner there is something grand, spectacular and awe-inspiring. History is entrenched here so deep it's intoxicating, and while most people associate Winchester with its magnificent Cathedral it's so much more than that. It's also home to the Round Table. This large wooden table dates from the early thirteenth century, making it close to 800 years old. Made of oak, it's 18 feet across, 3 inches thick and weighs approximately 1.5 tons. 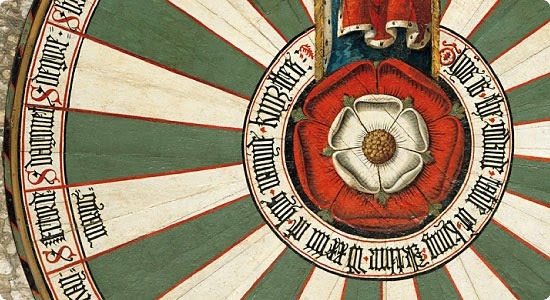 Originally it was unpainted, but at the beginning of King Henry VIII's reign he ordered the Tudor Rose painted at its centre. 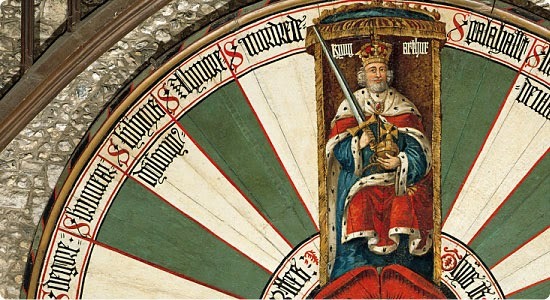 The portrait of King Arthur on his throne is thought to bear a remarkable likeness to Henry and he is surrounded by 24 places for Arthur's knights. The Great Hall is all that remains of Winchester Castle. The Castle, built in 1067 for William the Conquerer, was for many centuries the English capital until London replaced it. By the early 1200s the castle needed extensive repairs and the hall was replaced by this building. During the Civil War Cromwell ordered his men to destroy the castle, but spared the Great Hall. Since then it has been used as a venue for assemblies and the County Assizes. Sir Walter Raleigh stood trial for treason here in 1603 and as recently as the 1970s so too were members of the IRA. To mark the 60th anniversary of the Second World War the hanging centrepiece below that I think resembles a giant bird's nest but made of barbed wire rather than sticks and twigs is an homage to the horror of the trenches. The green and red toe tags heaped on the floor is a chilling reminder of the countless men and women who lost their lives while serving their country. In the far lefthand corner of the Great Hall is a bronze statue of Queen Victoria commissioned to celebrate her Diamond Jubilee. Queen Eleanor's Garden is on the south side of the building. A re-creation of a medieval garden it is dedicated to the two queens, Eleanor of Provence and her daughter-in-law Queen Eleanor of Castile, who likely used it as their private retreat. The gardens would have provided the women a quiet, private outdoor oasis as well as food and medicine. The Queen's Herber is a trellised corner with a mixed wild flower floor, turf seats and an octagonal table. Queen Eleanor's coat of arms is hanging on the arch of the door. The falcon fountain pays homage to the falcon houses that were often included in such garden spaces. The tunnel arbor attracts modern day visitors and encourages them to step inside as it surely did the Queens and their ladies. It would be lovely to see and experience it at the height of the summer growing season. As I mentioned earlier little remains of Winchester Castle except its foundations. The site was acquired by King Charles II in 1682. He hired Christopher Wren to build an elaborate palace called King's House that would rival the palace of Versailles. It was abandoned however when Charles died in 1685. Today is houses Winchester's Military Museums as well as private residences and is known as the Peninsula Barracks. With buildings on all four sides it was impossible to capture it in a single photo . Back at home Poppy insisted John play ball with her. Then, when she'd had enough she plopped onto the patio. As you can see from the look on her face, I think she's saying enough is enough!